"Aboriginal residential schools" redirects here. For the residential school system in the United States, see American Indian boarding schools. For other uses, see Indian school (disambiguation). In Canada, the Indian residential school system[nb 1] was a network of boarding schools for Indigenous peoples. [nb 2] The network was funded by the Canadian government's Department of Indian Affairs and administered by Christian churches. The school system was created for the purpose of removing Indigenous children from the influence of their own culture and assimilating them into the dominant Canadian culture. Over the course of the system's more than hundred-year existence, about 30 per cent of Indigenous children (around 150,000) were placed in residential schools nationally. :2–3 The number of school-related deaths remains unknown due to an incomplete historical record, though estimates range from 3,200 upwards of 6,000. The system had its origins in laws enacted before Confederation, but it was primarily active from the passage of the Indian Act in 1876. An amendment to the Indian Act in 1884 made attendance at day schools, industrial schools, or residential schools compulsory for First Nations children. Due to the remote nature of many communities, school locations meant that for some families residential schools were the only way to comply. The schools were intentionally located at substantial distances from Indigenous communities to minimize contact between families and their children. Indian Commissioner Hayter Reed argued for schools at greater distances to reduce family visits, which he thought counteracted efforts to civilize Indigenous children. Parental visits were further restricted by the use of a pass system designed to confine Indigenous peoples to reserves. The last federally operated residential school closed in 1996, called Gordon Indian Residential School and was located in Punnichy, Saskatchewan. Schools operated in every province and territory with the exception of New Brunswick and Prince Edward Island. The residential school system harmed Indigenous children significantly by removing them from their families, depriving them of their ancestral languages, exposing many of them to physical and sexual abuse, and forcibly enfranchising them. Disconnected from their families and culture and forced to speak English or French, students who attended the residential school system often graduated unable to fit into either their communities and still subject to racist attitudes in mainstream Canadian society. The system ultimately proved successful in disrupting the transmission of Indigenous practices and beliefs across generations. The legacy of the system has been linked to an increased prevalence of post-traumatic stress, alcoholism, substance abuse, and suicide, which persist within Indigenous communities today. On June 11, 2008, Prime Minister Stephen Harper offered a public apology on behalf of the Government of Canada and the leaders of the other federal parties in the House of Commons. Nine days prior, the Truth and Reconciliation Commission (TRC) was established to uncover the truth about the schools. The commission gathered about 7,000 statements from residential school survivors[nb 3] through public and private meetings at various local, regional and national events across Canada. Seven national events held between 2008 and 2013 commemorated the experience of former students of residential schools. In 2015, the TRC concluded with the establishment of the National Centre for Truth and Reconciliation, and the publication of a multi-volume report detailing the testimonies of survivors and historical documents from the time. The TRC report found that the school system amounted to cultural genocide. 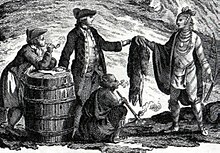 After a failure to assimilate Indigenous children by early missionaries in the 17th century, educational programs were not widely attempted again by religious officials until the 1820s, prior to the introduction of state-sanctioned operations. Included among them was a school established by John West, an Anglican missionary, at the Red River Colony in what is today Manitoba. :50 Protestant missionaries also opened residential schools in the current Ontario region, spreading Christianity and working to encourage Indigenous peoples to adopt subsistence agriculture as a way to ensure they would not return to their original, nomadic ways of life upon graduation. Although many of these early schools were open for only a short time, efforts persisted. The Mohawk Institute Residential School, the oldest, continuously operated residential school in Canada, opened in 1834 on Six Nations of the Grand River near Brantford, Ontario. Administered by the Anglican Church, the facility opened as the Mechanics' Institute, a day school for boys, in 1828 and became a boarding school four years later when it accepted its first boarders and began admitting female students. It remained in operation until June 30, 1970. Beginning in the late 1800s, the Canadian government's Department of Indian Affairs (DIA) officially encouraged the growth of the residential school system as a valuable component in a wider policy of integrating Indigenous people into European-Canadian society. Responsible for separating Indigenous children from their families and communities, this process was found by the TRC to be cultural genocide, a conclusion that echoed the words of historian John S. Milloy, who argued that the system's aim was to "kill the Indian in the child". :42 As the system was designed as an immersion program, Indigenous children were in many schools prohibited from, and sometimes punished for, speaking their own languages or practising their own faiths. The primary stated goal was to convert Indigenous children to Christianity and to civilize them. Front cover of Statistics Respecting Indian Schools, 1898, including Egerton Ryerson's letter "Report by Dr Ryerson on Industrial Schools"
On May 26, 1847, Ryerson wrote a letter for George Vardon, Assistant Superintendent of Indian Affairs, asserting that "the North American Indian cannot be civilized or preserved in a state of civilization (including habits of industry and sobriety) except in connection with, if not by the influence of, not only religious instruction and sentiment but of religious feelings". :3 He expressly recommended that Indigenous students be educated in a separate, denominational, English-only system with a focus on industrial training. This letter was published as an appendix to a larger report entitled Statistics Respecting Indian Schools. Between 1945 and 1955, the number of day schools run by Indian Affairs expanded from 9,532 to 17,947. The growth in day schools was accompanied by an amendment to the Indian Act in 1951 that allowed federal officials to establish agreements with provincial and territorial governments and school boards regarding the education of Indigenous students in the public school system. These changes were indicative of the government's shift in policy from assimilation-driven education at residential schools to the integration of Indigenous students into public schools. :71 It was believed that Indigenous children would receive a better education as a result of their transition into the public school system. 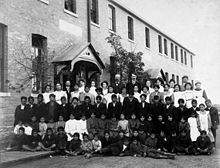 Until the late 1950s, when the federal government shifted to a day school integration model, residential schools were severely underfunded and often relied on the forced labour of their students to maintain their facilities, although it was presented as training for artisan skills. The work was arduous, and severely compromised the academic and social development of the students. School books and textbooks were drawn mainly from the curricula of the provincially funded public schools for non-Indigenous students, and teachers at the residential schools were often poorly trained or prepared. During this same period, Canadian government scientists performed nutritional tests on students and knowingly kept some students undernourished to serve as the control sample. Visitation, for those able to make the journey, was strictly controlled by school officials in a manner similar to the procedures enforced in the prison system. In some cases visitors were altogether denied access to their children, while in others families were required to meet in the presence of school officials and forced to communicate in English. For parents unable to speak the language, verbal communication with their children was impossible. The obstacles families faced to visit their children were further exacerbated by the pass system. Introduced by Reed without legislative authority to do so, the system restricted and closely monitored the movement of Indigenous peoples off reserves. :601–604 Launched in 1885 as a response to the North-West Rebellion, and later replaced by permits, the system was designed to prevent Indigenous people from leaving reserves without a pass issued by a local Indian agent. Instruction provided to students was rooted in an institutional and European approach to education. It differed dramatically from child rearing in traditional knowledge systems that are generally based on 'look, listen, and learn' models. Unlike the corporal punishment and loss of privileges that characterized the residential school system, traditional approaches to education favour positive guidance toward desired behaviour through the use of game-based play, story-telling, and formal ritualized ceremonies. :15–21 While at school, many children had no contact with their families for up to 10 months at a time because of the distance between their home communities and schools, and in some cases had no contact for years. The impact of the disconnect from their families was furthered by students being discouraged or prohibited from speaking Indigenous languages, even among themselves and outside the classroom, so that English or French would be learned and their own languages forgotten. In some schools, they were subject to physical violence for speaking their own languages or for practicing non-Christian faiths. Residential school deaths were common and have been linked to the persistence of poorly constructed and maintained facilities. :92–101 The actual number of deaths remains unknown due to inconsistent reporting by school officials and the destruction of medical and administrative records in compliance with retention and disposition policies for government records. :92–93 Research by the TRC revealed that at least 3,201 students had died, mostly from disease. :92 TRC chair, Justice Murray Sinclair, has suggested that the number of deaths may be closer to more than 6,000. In 2011, reflecting on the TRC's research, Justice Murray Sinclair told the Toronto Star: "Missing children – that is the big surprise for me ... That such large numbers of children died at the schools. That the information of their deaths was not communicated back to their families." The TRC concluded that it may be impossible to ever identify the number of deaths or missing children, in part because of the habit of burying students in unmarked graves. The work is further complicated by a pattern of poor record keeping by school and government officials, who neglected to keep reliable numbers about the number of children who died or where they were buried. 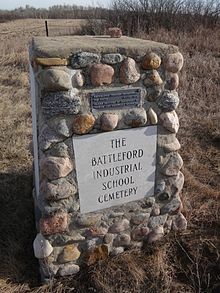 While most schools had cemeteries on site, their location and extent remain difficult to determine as cemeteries that were originally marked were found to have been later razed, intentionally hidden or built over. When the government revised the Indian Act in the 1940s and 1950s, some bands, along with regional and national Indigenous organizations, wanted to maintain schools in their communities. Motivations for support of the schools included their role as a social service in communities that were suffering from extensive family breakdowns; the significance of the schools as employers; and the inadequacy of other opportunities for children to receive education. In the summer of 1970, members of the Saddle Lake community occupied the building and demanded the right to run it themselves. More than 1,000 people are believed to have participated over the course of the 17-day sit-in, which lasted from July 14 to 31.:89–90 Their efforts resulted in Blue Quills becoming the first Indigenous-administered school in the country. It continues to operate today as University nuhelot’įne thaiyots’į nistameyimâkanak Blue Quills, the first Indigenous-governed university in Canada. Following the success of the Blue Quills effort the National Indian Brotherhood (NIB) released the 1972 paper Indian Control of Indian Education that responded, in part, to the Canadian Government's 1969 White Paper calling for the abolishment of the land treaties and the Indian Act. The NIB paper underscored the right of Indigenous communities to locally direct how their children are educated and served as the integral reference for education policy moving forward. Few other former residential schools have transitioned into independently-operated community schools for Indigenous children. White Calf Collegiate in Lebret, Saskatchewan, was run by the Star Blanket Cree Nation from 1973 until its closure in 1998, after being run by the Oblates from 1884 to 1969. Old Sun Community College is run by the Siksika Nation in Alberta in a building designed by architect Roland Guerney Orr. From 1929 to 1971 the building housed Old Sun residential school, first run by the Anglicans and taken over by the federal government in 1969. It was converted to adult learning and stood as a campus of Mount Royal College from 1971 to 1978, at which point the Siksika Nation took over operations. In 1988, the Old Sun College Act was passed in the Alberta Legislature recognizing Old Sun Community College as a First Nations College. The 2012 national report of the First Nations Regional Health Study found that of respondents who attended residential schools were more likely than those who did not to have been diagnosed with at least one chronic medical condition. A sample of 127 survivors revealed that half have criminal records; 65 per cent have been diagnosed with posttraumatic stress disorder; 21 per cent have been diagnosed with major depression; 7 per cent have been diagnosed with anxiety disorder; and 7 per cent have been diagnosed with borderline personality disorder. The stigma created by the residential school system regarding transmission of Indigenous culture by elders to younger generations has been linked to the over-representation of Indigenous languages on the list of endangered languages in Canada. The TRC noted that the majority of 90 Indigenous languages still in existence are "under serious threat of extinction". :202 With great-grandparents representing the only speakers of many Indigenous languages, it was concluded that a failure of governments and Indigenous communities to prioritize the teaching and preservation of traditional languages would ensure that, despite the closure of resident schools, the eradication of Indigenous culture desired by government officials and administrators would inevitably be fulfilled "through a process systemic neglect". :202 In addition to the forceful eradication of elements of Indigenous culture, the schools trained students in patriarchal dichotomies useful to state institutions, such as the domesticization of female students through imbuing ‘stay-at-home’ values and the militarization of male students through soldierlike regimentation. Former St. Michael's Residential School in Alert Bay, British Columbia. Formerly standing on the traditional territory of the ‘Namgis First Nation, it was demolished in February 2015. In January 1998, the government made a "statement of reconciliation" – including an apology to those people who were sexually or physically abused while attending residential schools – and established the Aboriginal Healing Foundation (AHF). The foundation was provided with $350 million to fund community-based healing projects addressing the legacy of physical and sexual abuse. In its 2005 budget, the Canadian government committed an additional $40 million to support the work of the AHF. Federal funding for the foundation was cut in 2010 by the Stephen Harper government, leaving 134 national healing-related initiatives without an operating budget. The AHF closed in 2014. Former AHF executive director Mike DeGagne has said that the loss of AHF support has created a gap in dealing with mental health crises such as suicides in the Attawapiskat First Nation. On November 23, 2005, the Canadian government announced a $1.9-billion compensation package to benefit tens of thousands of former students. National Chief of the AFN, Phil Fontaine, said the package was meant to cover "decades in time, innumerable events and countless injuries to First Nations individuals and communities". Justice Minister Irwin Cotler applauded the compensation decision noting that the placement of children in the residential school system was "the single most harmful, disgraceful and racist act in our history". At an Ottawa news conference, Deputy Prime Minister Anne McLellan said: "We have made good on our shared resolve to deliver what I firmly believe will be a fair and lasting resolution of the Indian school legacy." The IRSSA also included the Independent Assessment Process (IAP), a case-by-case, out-of-court resolution process designed to provide compensation for sexual, physical and emotional abuse. The IAP process was built on the ADR program and all IAP claims from former students are examined by an adjudicator. The IAP became available to all former students of residential schools on September 19, 2007. Former students who experienced abuse and wished to pursue compensation had to apply by themselves or through a lawyer of their choice to receive consideration. The deadline to apply for the IAP was September 19, 2012. This gave former students of residential schools four years from the implementation date of the IRSSA to apply for the IAP. Claims involving physical and sexual abuse were compensated up to $275,000. By the end of January 2017, the IAP had resolved 36,538 claims and paid $3.1 billion in compensation. The IRSSA also proposed an advance payment for former students alive and who were 65 years old and over as of May 30, 2005. The deadline for reception of the advance payment form by IRSRC was December 31, 2006. Following a legal process, including an examination of the IRSSA by the courts of the provinces and territories of Canada, an "opt-out" period occurred. During this time, the former students of residential schools could reject the agreement if they did not agree with its dispositions. This opt-out period ended on August 20, 2007, with about 350 former students opting out. The IRSSA was the largest class action settlement in Canadian history. By December 2012, a total of $1.62 billion was paid to 78,750 former students, 98 per cent of the 80,000 who were eligible. In 2014, the IRSSA funds left over from CEPs were offered for educational credits for survivors and their families. In 2008, the Truth and Reconciliation Commission (TRC) was established to travel across Canada collecting the testimonies of people affected by the residential school system. About 7,000 Indigenous people told their stories. The TRC concluded in 2015 with the publication of a six volume, 4,000-plus-page report detailing the testimonies of survivors and historical documents from the time. It focused on the importance of moving "from apology to action":262 to achieve true reconciliation and resulted in the establishment of the National Centre for Truth and Reconciliation. The executive summary of the TRC concluded that the assimilation amounted to cultural genocide. :1 The ambiguity of the phrasing allowed for the interpretation that physical and biological genocide also occurred. The TRC was not authorized to conclude that physical and biological genocide occurred, as such a finding would imply a legal responsibility of the Canadian government that would be difficult to prove. As a result, the debate about whether the Canadian government also committed physical and biological genocide against Indigenous populations remains open. Among the 94 Calls to Action that accompanied the conclusion of the TRC were recommendations to ensure that all Canadians are educated and made aware of the residential school system. :175–176 Justice Murray Sinclair explained that the recommendations were not aimed solely at prompting government action, but instead a collective move toward reconciliation in which all Canadians have a role to play: "Many of our elements, many of our recommendations and many of the Calls to Action are actually aimed at Canadian society." Preservation of documentation of the legacy of residential schools was also highlighted as part of the TRC's Calls to Action. Community groups and other stakeholders have variously argued for documenting or destroying evidence and testimony of residential school abuses. On April 4, 2016, the Ontario Court of Appeal ruled that documents pertaining to IAP settlements will be destroyed in 15 years if individual claimants do not request to have their documents archived. This decision was fought by the TRC as well as the federal government, but argued for by religious representatives. In March 2017, Lynn Beyak, a Conservative member of the Senate Standing Committee of Aboriginal Peoples, voiced disapproval of the final TRC report, saying that it had omitted an "abundance of good" that was present in the schools. Although Beyak's right to free speech was defended by some Conservative senators, her comments were widely criticized by members of the opposition, among them Minister of Indigenous and Northern Affairs, Carolyn Bennett, and leader of the New Democratic Party, Tom Mulcair. The Anglican Church also raised concerns stating in a release co-signed by bishops Fred Hiltz and Mark MacDonald: "There was nothing good about children going missing and no report being filed. There was nothing good about burying children in unmarked graves far from their ancestral homes." In response, the Conservative Party leadership removed Beyak from the Senate committee underscoring that her comments did not align with the views of the party. The four churches of the Indian Residential Schools Settlement Agreement – the United, Roman Catholic, Anglican and Presbyterian churches – agreed to participate in the reconciliation process between Indigenous and settler Canadians. They have been involved in funding various projects and services that assist former residential school students and their families in healing from the trauma caused by the schools. The Anglican Church of Canada set up the Anglican Healing Fund in the 1990s to respond to the ongoing need for healing related to residential schools. In the 2000s the United Church established the Justice and Reconciliation Fund to support healing initiatives and the Presbyterian Church has established a Healing & Reconciliation Program. The churches have also engaged in reconciliation initiatives such as the Returning to Spirit: Residential School Healing and Reconciliation Program, a workshop that aims to unite Indigenous and non-Indigenous people through discussing the legacy of residential schools and fostering an environment for them to communicate and develop mutual understanding. In 2014, the federal government ceased to contribute funds to Indigenous health organizations such as the AHF and the National Aboriginal Health Organization. Since then, more pressure has been placed on churches to sustain their active participation in these healing efforts. For many communities the existence of buildings that formerly housed residential schools is a traumatic reminder of the system's legacy, and there has been much discussion about demolition, heritage status and how the possibility of incorporating sites into the healing process. In July 2016, it was announced that the building of the former Mohawk Institute Residential School would be converted into an educational centre with exhibits on the legacy of residential schools. Ontario's Minister of Indigenous Relations and Reconciliation, David Zimmer, noted: "Its presence will always be a reminder of colonization and the racism of the residential school system; one of the darkest chapters of Canadian history." Reconciliation efforts have also been undertaken by several Canadian universities. In 2015 Lakehead University and the University of Winnipeg introduced a mandatory course requirement for all undergraduate students focused on Indigenous culture and history. The same year the University of Saskatchewan hosted a two-day national forum at which Canadian university administrators, scholars and members of Indigenous communities discussed how Canadian universities can and should respond to the TRC's Calls to Action. On April 1, 2017, a 17-metre (56 ft) pole, titled Reconciliation Pole, was raised on the grounds of the University of British Columbia (UBC) Vancouver campus, which sits on the unceded territory of the Musqueam people. Carved by Haida master carver and hereditary chief, 7idansuu (Edenshaw), James Hart, the pole tells the story of the residential school system prior to, during and after its operation. It features thousands of copper nails, used to represent the children who died in Canadian residential schools, and depictions of residential school survivors carved by artists from multiple Indigenous communities. Included among them are Canadian Inuk director Zacharias Kunuk, Maliseet artist Shane Perley-Dutcher, and Muqueam Coast Salish artist Susan Point. In October 2016, Canadian singer-songwriter Gord Downie released Secret Path, a concept album about Chanie Wenjack's escape and death. It was accompanied by a graphic novel and animated film, aired on CBC Television. All proceeds go to the University of Manitoba's Centre for Truth and Reconciliation. Following his death in October 2017, Downie's brother Mike said he was aware of 40,000 teachers who had used the material in their classrooms, and hoped to continue this. In December 2017, Downie was posthumously named Canadian Newsmaker of the Year by the Canadian Press, in part because of his work with reconciliation efforts for survivors of residential schools. ^ Indian has been used because of the historical nature of the article and the precision of the name. It was, and continues to be, used by government officials, Indigenous peoples and historians while referencing the school system. The use of the name also provides relevant context about the era in which the system was established, specifically one in which Indigenous peoples in Canada were homogeneously referred to as Indians rather than by language that distinguishes First Nations, Inuit and Métis peoples. Use of Indian is limited throughout the article to proper nouns and references to government legislation. ^ a b c "Residential Schools Overview". University of Manitoba. Archived from the original on April 20, 2016. Retrieved April 14, 2017. ^ a b c d e f g h i j k l m n o p q r s t u v w "Honouring the Truth, Reconciling for the Future: Summary of the Final Report of the Truth and Reconciliation Commission of Canada" (PDF). National Centre for Truth and Reconciliation. Truth and Reconciliation Commission of Canada. May 31, 2015. Archived from the original (PDF) on July 6, 2016. Retrieved June 28, 2016. ^ a b Tasker, John Paul (May 29, 2015). "Residential schools findings point to 'cultural genocide', commission chair says". CBC News. Archived from the original on May 18, 2016. Retrieved July 1, 2016. ^ a b c d Smith, Joanna (December 15, 2015). "Truth and Reconciliation Commission's report details deaths of 3,201 children in residential schools". Toronto Star. Archived from the original on August 26, 2016. Retrieved November 27, 2016. ^ a b c Miller, J.R. (October 10, 2012). "Residential Schools". The Canadian Encyclopedia. Historica Canada. Archived from the original on January 28, 2017. Retrieved April 10, 2017. ^ Gourdeau, Claire. "Population – Religious Congregations". Virtual Museum of New France. Canadian Museum of History. Archived from the original on July 8, 2016. Retrieved July 1, 2016. ^ White, Jerry P.; Peters, Julie (2009). "A Short History of Aboriginal Education in Canada". In White, Jerry P.; Peters, Julie; Beavon, Dan; Spence, Nicholas. Aboriginal Education: Current Crisis and Future Alternatives (PDF). Thompson Educational Pub. ISBN 978-1-55077-185-5. Archived (PDF) from the original on October 3, 2016. ^ a b Carney, Robert (1995). "Aboriginal Residential Schools Before Confederation: The Early Experience" (PDF). Historical Studies. 61: 13–40. Archived (PDF) from the original on August 14, 2016. Retrieved June 29, 2016. ^ a b c Gordon, Catherine E.; White, Jerry P. (June 2014). "Indigenous Educational Attainment in Canada". International Indigenous Policy Journal. 5 (3). doi:10.18584/iipj.2014.5.3.6. Archived from the original on November 30, 2015. Retrieved June 27, 2016. ^ a b c d e f g h i j Miller, James Rodger (1996). Shingwauk's Vision: A History of Native Residential Schools. University of Toronto Press. ISBN 978-0-8020-7858-2. Retrieved May 1, 2017. ^ a b "A timeline of residential schools, the Truth and Reconciliation Commission". CBC News. May 16, 2008. Archived from the original on September 16, 2016. Retrieved September 5, 2016. ^ a b c d e f g h i j k l Milloy, John S. (1999). A National Crime: The Canadian Government and the Residential School System 1879–1986. University of Manitoba Press. ISBN 0-88755-646-9. ^ "The Mohawk Institute – Brantford, ON". Anglican Church of Canada. September 23, 2008. Archived from the original on November 14, 2016. Retrieved May 5, 2017. ^ Wilson, J. Donald (1986). "'No blanket to be worn in school': The education of Indians in nineteenth-century Ontario". In Barman, Jean; Hébert, Yvonne; McCaskill, Don. Indian Education in Canada, Volume 1: The Legacy. University of British Columbia Press. ISBN 978-0-7748-5313-2. ^ a b "The Residential School System". Indigenous Foundations. UBC First Nations and Indigenous Studies. Retrieved April 14, 2017. ^ Luxen, Micah (June 24, 2016). "Survivors of Canada's 'cultural genocide' still healing". BBC. Archived from the original on July 25, 2016. Retrieved June 28, 2016. ^ a b Curry, Bill; Howlett, Karen (April 24, 2007). "Natives died in droves as Ottawa ignored warnings". The Globe and Mail. Archived from the original on August 27, 2016. Retrieved June 29, 2016. ^ a b c d e f g h i j k l m n o p "Canada's Residential Schools: The History, Part 1 Origins to 1939: Final Report of the Truth and Reconciliation Commission of Canada Volume 1" (PDF). National Centre for Truth and Reconciliation. Truth and Reconciliation Commission of Canada. 2015. Retrieved July 1, 2016. ^ a b Dickason, Olive Patricia (1998). Canada's First Nations: A History of Founding Peoples from Earliest Times (2nd ed.). Oxford University Press. p. 309. ISBN 0-19-541358-X. ^ Rawson W. Rawson; John Davidson; William Hepburn (March 20, 1845). "Report on the affairs of the Indians in Canada, laid before the Legislative Assembly, 20th March, 1845" (PDF). National Centre for Truth and Reconciliation. [not identified]. Retrieved July 12, 2016. ^ a b "Egerton Ryerson, the Residential School System and Truth and Reconciliation" (PDF). Ryerson University. August 2010. Archived (PDF) from the original on April 29, 2016. Retrieved June 28, 2016. ^ a b Ryerson, Egerton (1847). "Statistics Respecting Residential Schools, Appendix A: Report by Dr Ryerson on Industrial Schools" (PDF). National Centre for Truth and Reconciliation (Letter to George Vardon, Assistant Superintendent of Indian Affairs). Indian Affairs. Retrieved June 28, 2016. ^ Comeau, Sylvain (March 23, 2003). "First Nations Act draws fire from SCPA panel". Concordia's Thursday Report Online. Archived from the original on July 28, 2009. Retrieved December 2, 2009. ^ "An Act to encourage the gradual Civilization of the Indian Tribes in this Province, and to amend the Laws respecting Indians". Statutes of the Province of Canada. S. Derbishire & G. Desbarats, Law Printer to the Queen's Most Excellent Majesty. 1857. pp. 84–88. Retrieved April 26, 2017. ^ a b c Davin, Nicholas Flood (1879). Report on industrial schools for Indians and half-breeds (microform) (Report). [Ottawa? : s.n., 1879?]. Archived from the original on May 29, 2016. Retrieved July 11, 2016. ^ Henderson, Jennifer; Wakeham, Pauline, eds. (2013). "Appendix A: Aboriginal Peoples and Residential Schools". Reconciling Canada: Critical Perspectives on the Culture of Redress. Toronto: University of Toronto Press. ISBN 978-1-4426-1168-9. Retrieved May 5, 2017. ^ a b c d e f g h i j k l "Canada's Residential Schools: The History, Part 2, 1939 to 2000: The Final Report of the Truth and Reconciliation Commission of Canada Volume 1" (PDF). National Centre for Truth and Reconciliation. Truth and Reconciliation Commission of Canada. January 1, 2016. Retrieved May 5, 2017. ^ a b Hanson, Erin. "Sixties Scoop". Indigenous Foundations. UBC First Nations and Indigenous Studies. Retrieved March 25, 2017. ^ a b Dainard, Sharon (June 21, 2016). "Sixties Scoop". The Canadian Encyclopedia. Historica Canada. Archived from the original on July 9, 2016. Retrieved March 26, 2017. ^ "Child Welfare Services in Canada: Aboriginal & Mainstream" (PDF). National Collaborating Centre for Aboriginal Health. 2010. Archived from the original (PDF) on November 23, 2015. Retrieved March 26, 2017. ^ a b Vowel, Chelsea (2017). Indigenous Writes: A Guide to First Nations, Métis & Inuit Issues in Canada. Portage & Main Press. ISBN 978-1-55379-689-3. Retrieved May 6, 2017. ^ Rheault, D'Arcy (2011). "Solving the 'Indian Problem': Assimilation Laws, Practices & Indian Residential Schools" (PDF). Ontario Métis Family Records Centre. Archived (PDF) from the original on April 27, 2017. Retrieved April 22, 2017. ^ a b "A history of residential schools in Canada: FAQs on residential schools, compensation and the Truth and Reconciliation Commission". CBC News. March 21, 2016. Archived from the original on September 11, 2016. Retrieved September 5, 2016. ^ Dupuis, Josée (October 27, 2016). "Escape and resist: An untold history of residential schools in Quebec". CBC News. Archived from the original on December 12, 2016. Retrieved December 3, 2016. ^ Department of Indian Affairs (1908). "Regulations relating to the education of Indian children". Peel's Prairie Provinces. Government Printing Bureau. Archived from the original on August 8, 2016. Retrieved July 1, 2016. ^ Haig-Brown, Celia (1988). Resistance and Renewal: Surviving the Indian Residential School. Arsenal Pulp Press Ltd. p. 32. ISBN 0-88978-189-3. ^ "Carmacks, Yukon: A Northern Tutchone Homeland – 2.3 K'uch'an Adäw: Churches and Schools". Virtual Museum of Canada. Canadian Museum of History. Archived from the original on August 18, 2016. Retrieved August 15, 2016. ^ Mosby, Ian (July 2013). "Administering Colonial Science: Nutrition Research and Human Biomedical Experimentation in Aboriginal Communities and Residential Schools, 1942–1952". Histoire sociale/Social history. 46 (91): 145–172. Archived from the original on July 23, 2013. Retrieved August 2, 2013. 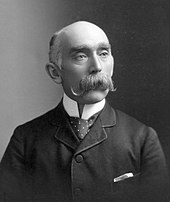 ^ Titley, E. Brian. "Reed, Hayter". Dictionary of Canadian Biography. University of Toronto/Université Laval. Archived from the original on November 28, 2016. Retrieved November 27, 2016. ^ Benjoe, Kerry (November 26, 2015). "First Nation reserves prior to 1960s were 'open-air prisons,' says Saskatoon filmmaker behind The Pass System". Regina Leader-Post. Archived from the original on November 28, 2016. Retrieved November 27, 2016. ^ Partridge, Cheryle (2010). "Residential Schools: The Intergenerational Impacts on Aboriginal Peoples" (PDF). Native Social Work Journal. 7: 33–62. Retrieved May 1, 2017. ^ Chrisjohn, Roland D.; Young, Sherri L.; Maraun, Michael (1997). The circle game: shadows and substance in the Indian residential school experience in Canada. Theytus Books. ISBN 978-0-919441-85-9. ^ "Canada's Dark Secret". www.aljazeera.com. Retrieved May 20, 2018. 6,000 children died in these schools. Some evidence puts the casualties at three times that number. ^ Schwartz, Daniel (15 December 2015). "341 students died at Northern residential schools". CBC. Retrieved 31 July 2018. Sinclair said the total number of recorded residential school deaths in Canada – 3,201 – could be an underestimate given poor record keeping, and the real number of deaths could have been five to 10 times higher. ^ a b Bryce, Peter H. Annual Report of the Department of Indian Affairs, for the fiscal year ended 30th June, 1906 (Report). Department of Indian Affairs. pp. 272–284. Archived from the original on August 29, 2016. Retrieved July 1, 2016. ^ "New documents may shed light on residential school deaths". CBC News. January 7, 2014. Archived from the original on September 23, 2016. Retrieved August 24, 2016. ^ "Who was Dr. Peter Henderson Bryce?". First Nations Child & Family Caring Society of Canada. Archived from the original on April 16, 2016. Retrieved September 5, 2016. ^ Deachman, Bruce (August 14, 2015). "Beechwood ceremony to honour medical officer's tenacity". Ottawa Citizen. Archived from the original on September 15, 2016. Retrieved September 5, 2016. ^ Edwards, Peter (June 10, 2011). "This is not just an aboriginal issue. This is a Canadian issue". Toronto Star. Archived from the original on November 28, 2016. Retrieved November 27, 2016. ^ Barrera, Jorge (April 22, 2017). "Identities, bodies of children who died in residential schools may be lost forever". APTN National News. Archived from the original on March 5, 2017. Retrieved November 27, 2016. ^ Schroeder, Janice (June 17, 2015). "Children taught to hate themselves says TRC report". Canadian Mennonite. Archived from the original on September 19, 2016. Retrieved November 27, 2016. ^ a b Leung, Marlene (December 15, 2015). "Aboriginal children at residential schools often buried in unmarked graves, report reveals". CTV News. Archived from the original on November 17, 2016. Retrieved November 27, 2016. ^ Paul, Alexandra (February 19, 2011). "Where are the children buried?". Winnipeg Free Press. Archived from the original on November 10, 2016. Retrieved November 27, 2016. ^ "Canada's Residential Schools: Missing Children and Unmarked Burials The Final Report of the Truth and Reconciliation Commission of Canada, Volume 4" (PDF). National Centre for Truth and Reconciliation. Truth and Reconciliation Commission of Canada. 2016. ^ O'Hara, Jane; Treble, Patricia (June 26, 2000). "Abuse of Trust: What happened behind the walls of residential church schools is a tragedy that has left native victims traumatized". Maclean's. Archived from the original on September 18, 2016. Retrieved September 5, 2016. ^ "First Nations transform residential school into Blue Quills college". CBC News. March 25, 2014. Archived from the original on April 28, 2017. Retrieved April 22, 2017. ^ Narine, Shari (2015). "Blue Quills celebrates new status as Indigenous-controlled university". Alberta Sweetgrass. 23 (1). Archived from the original on August 3, 2016. Retrieved February 18, 2017. ^ "About Us". University nuhelot’įne thaiyots’į nistameyimâkanak Blue Quills. Archived from the original on February 19, 2017. Retrieved February 18, 2017. ^ LaRose, Stephen (1999). "Wrecker's ball claims White Calf Collegiate". Saskatchewan Sage. Aboriginal Multi-Media Society. 3 (8): 18. Archived from the original on April 25, 2015. Retrieved May 5, 2017. ^ Miłosz, Magdalena. "Claiming Remnants: Intergenerational Representations and the Vicarious Pasts of Indian Residential Schools". Breach. Archived from the original on September 17, 2016. Retrieved September 5, 2016. ^ Hill, Robert G. "Orr, Roland Guerney". Biographical Dictionary of Architects in Canada 1800–1950. Retrieved May 5, 2017. ^ "Old Sun School – Gleichen, AB". Anglican Church of Canada. Archived from the original on August 7, 2016. Retrieved June 29, 2016. ^ "Our History". Old Sun Community College. Archived from the original on September 3, 2016. Retrieved September 5, 2016. ^ Reimer, Gwen (2010). "The Indian Residential Schools Settlement Agreement's Common Experience Payment and Healing: A Qualitative Study Exploring Impacts on Recipients" (PDF). Aboriginal Healing Foundation. Archived (PDF) from the original on September 9, 2016. Retrieved August 31, 2016. ^ a b Robertson, Lloyd Hawkeye (2006). "The Residential School Experience: Syndrome or Historic Trauma" (PDF). Pimatisiwin. 4 (1). Archived (PDF) from the original on August 26, 2016. Retrieved June 28, 2016. ^ Wesley-Esquimaux, Cynthia C.; Smolewski, Magdalena (2004). "Historic Trauma and Aboriginal Healing" (PDF). Aboriginal Healing Foundation. Archived (PDF) from the original on September 14, 2016. Retrieved July 12, 2016. ^ First Nations Regional Health Survey (RHS) 2008/10: National Report on Adults, Youth and Children living in First Nations Communities (PDF) (Report). First Nations Information Governance Centre. 2012. Archived (PDF) from the original on August 25, 2016. Retrieved August 31, 2016. ^ Galley, Valerie (2009). "Reconciliation and the Revitalization of Indigenous Languages". In Younging, Gregory; Dewar, Jonathan; DeGagné, Mike. Response, responsibility and renewal: Canada's truth and reconciliation journey (PDF). Aboriginal Healing Foundation. ISBN 978-1-897285-72-5. Archived from the original (PDF) on October 24, 2016. Retrieved March 26, 2017. ^ a b "Residential Schools Timeline". National Centre for Truth and Reconciliation. Retrieved September 5, 2016. ^ a b c "The Survivors Speak: A Report of the Truth and Reconciliation Commission of Canada" (PDF). The Truth and Reconciliation Commission of Canada. May 30, 2015. Archived (PDF) from the original on January 10, 2016. Retrieved February 4, 2016. ^ Lomawaima, K. Tsianina (September 1992). "Domesticity in the Federal Indian Schools: the Power of Authority over Mind and Body". American Ethnologist. 20: 227 – via AnthroSource. ^ a b Hiltz, Fred (August 6, 2013). "A step along the path". Anglican Church of Canada. Archived from the original on March 7, 2016. Retrieved June 27, 2016. ^ "The Apologies". United Church of Canada. January 21, 2016. Archived from the original on June 29, 2016. Retrieved July 6, 2016. ^ "An apology to the First Nations of Canada by the Oblate Conference of Canada" (PDF). Canadian Conference of Catholic Bishops. Archived (PDF) from the original on October 25, 2016. Retrieved September 5, 2016. ^ "More Healing & Reconciliation: The Confession of 1994". The Presbyterian Church in Canada. Archived from the original on May 18, 2017. Retrieved April 22, 2017. ^ "RCMP apology". Royal Canadian Mounted Police. January 24, 2012. Archived from the original on June 3, 2012. Retrieved July 10, 2012. ^ Tutton, Michael (October 29, 2011). "RCMP mostly unaware of abuse at residential schools: report". The Globe and Mail. Retrieved June 4, 2017. ^ "PM cites 'sad chapter' in apology for residential schools". CBC News. June 11, 2008. Archived from the original on January 14, 2017. Retrieved May 5, 2017. ^ "Harper apologizes for residential school abuse". CTV News. June 11, 2008. Archived from the original on July 9, 2008. ^ Smith, Joanna (June 13, 2008). "NDP aide's Commons sense saved the day". Toronto Star. Archived from the original on December 21, 2016. Retrieved April 22, 2017. ^ "Ottawa agrees to pay survivors of Newfoundland residential schools". The Globe and Mail. May 10, 2016. Archived from the original on June 10, 2016. Retrieved June 28, 2016. ^ Kelland, Arianna; Quinn, Mark (May 10, 2016). "N.L. residential school survivors' lawyers reach $50M settlement with Ottawa". CBC News. Archived from the original on June 25, 2016. Retrieved June 28, 2016. ^ a b c "Trudeau apologizes to Newfoundland residential school survivors left out of 2008 apology, compensation". The Toronto Star. November 24, 2017. Retrieved December 16, 2017. ^ "Prime Minister delivers apology to former students of Newfoundland and Labrador residential schools". Prime Minister of Canada. November 24, 2017. Retrieved December 16, 2017. ^ McIntyre, Catherine (November 24, 2017). "Read Justin Trudeau's apology to residential school survivors in Newfoundland". Macleans.ca. Retrieved December 16, 2017. ^ a b "Innu Nation won't accept PM's apology for residential schools in N.L." CBC News. November 23, 2017. Retrieved December 16, 2017. ^ "Text of Alberta Premier Rachel Notley's apology to residential school survivors". APTN News. June 23, 2015. Archived from the original on May 7, 2017. Retrieved April 22, 2017. ^ Tait, Carrie (June 26, 2015). "How Alberta intends to follow up on its apology to First Nations". The Globe and Mail. Archived from the original on August 26, 2016. Retrieved June 28, 2016. ^ Murray, James (June 20, 2015). "Manitoba Premier Greg Selinger issues sixties scoop apology". Net News Ledger. Archived from the original on July 25, 2016. Retrieved June 28, 2015. ^ "Manitoba apology for '60s Scoop 'only the first step toward total reconciliation'". Saskatoon Star Phoenix. June 17, 2015. Archived from the original on June 20, 2016. Retrieved June 28, 2016. ^ "Greg Selinger, Manitoba premier, apologizes for Sixties Scoop". CBC News. June 18, 2015. Archived from the original on April 28, 2017. Retrieved April 22, 2017. ^ "Kathleen Wynne officially apologizes to Indigenous communities for 'generations of abuse'". CBC News. May 30, 2015. Archived from the original on July 3, 2016. Retrieved June 28, 2016. ^ "Ontario apologizes for residential Schools: government releases action plan for reconciliation with Indigenous peoples". Ontario Newsroom. Office of the Premier. May 30, 2016. Archived from the original on October 26, 2016. Retrieved October 25, 2016. ^ Benzie, Robert (May 30, 2015). "Kathleen Wynne offers indigenous people 'a formal apology for the abuses of the past'". Toronto Star. Archived from the original on May 30, 2016. Retrieved June 28, 2015. ^ Wynne, Kathleen (May 30, 2016). Ontario's Commitment to Reconciliation with Indigenous Peoples (Speech). Event. Legislative Assembly. Archived from the original on January 1, 2017. Retrieved April 14, 2017. ^ Martin, Nick (October 26, 2011). "U of M sorry for role in residential schools". Winnipeg Free Press. Archived from the original on March 4, 2016. Retrieved June 27, 2016. ^ "Canada – Communiqué of the Holy See Press Office". The Holy See. Vatican. April 29, 2009. Archived from the original on June 24, 2016. Retrieved September 5, 2016. ^ Curry, Bill (April 29, 2009). "Pope expresses sorrow for residential-school abuse". The Globe and Mail. Archived from the original on September 19, 2016. Retrieved September 5, 2016. ^ a b "Trudeau asks Pope Francis to apologise to indigenous people for church's abuses". The Guardian. May 29, 2017. Retrieved December 22, 2017. ^ Smith, Joanna. "Trudeau meets Pope, looking for residential school apology". CBC News. Retrieved December 22, 2017. ^ "Justin Trudeau asks Pope for apology". BBC News. May 29, 2017. Retrieved December 22, 2017. ^ Johnson, Rhiannon (May 19, 2017). "Justin Trudeau wants the Pope to say 'sorry'". VICE News. Retrieved December 22, 2017. ^ "Alert Bay residential school survivors gather for demolition ceremony". The Globe and Mail. February 18, 2015. Archived from the original on February 20, 2015. Retrieved May 20, 2015. ^ "Highlights from the Report of the Royal Commission on Aboriginal Peoples". Indigenous and Northern Affairs Canada. 1996. Archived from the original on April 30, 2017. Retrieved April 13, 2017. ^ "Summary Points of the AHF Final Report" (PDF). Aboriginal Healing Foundation. Archived (PDF) from the original on September 28, 2016. Retrieved December 26, 2016. ^ "Aboriginal Healing Foundation closes after 16 years" (PDF). Aboriginal Healing Foundation. September 30, 2014. Archived (PDF) from the original on September 14, 2016. Retrieved February 18, 2017. ^ Rolbin-Ghanie, Maya (March 20, 2010). "Funding cuts a catastrophe for residential school survivors". rabble.ca. Archived from the original on December 23, 2016. Retrieved February 18, 2017. ^ "Head of defunct Aboriginal Healing Foundation laments loss of mental-health programs". CTV News. April 13, 2016. Archived from the original on December 23, 2016. Retrieved February 18, 2017. ^ "Timeline – Indian Residential Schools". Indigenous and Northern Affairs Canada. May 27, 2015. Archived from the original on May 16, 2017. Retrieved May 5, 2017. ^ Petoukhov, Konstantin (February 2013). "Recognition, Redistribution, and Representation: Assessing the Transformative Potential of Reparations for the Indian Residential Schools Experience". McGill Sociological Review. 3: 73–91. Archived from the original on September 12, 2016. Retrieved September 5, 2016. ^ a b c "School abuse victims getting $1.9B". CBC News. November 23, 2005. Archived from the original on October 1, 2016. Retrieved April 27, 2007. ^ "Indian Residential Schools". Indigenous and Northern Affairs Canada. Archived from the original on June 29, 2016. Retrieved June 28, 2016. ^ "Common Experience Payments". Indigenous and Northern Affairs Canada. Archived from the original on May 16, 2017. Retrieved May 2, 2017. ^ Marshall, Tabitha (November 7, 2013). "Indian Residential Schools Settlement Agreement". The Canadian Encyclopedia. Historica Canada. Archived from the original on December 20, 2016. Retrieved May 2, 2017. ^ "Indian Residential Schools Settlement Agreement" (PDF). Residential Schools Settlement. Residential Schools Class Action Litigation. May 8, 2006. Retrieved May 7, 2017. ^ "About the Independent Assessment Process". Indian Residential Schools Adjudication Secretariat. 2007. Archived from the original on August 17, 2016. Retrieved July 14, 2016. ^ "Schedule "D" Independent Assessment Process (IAP) For Continuing Indian Residential School Abuse Claims". Indian Residential Schools Adjudication Secretariat. Archived from the original on October 14, 2016. Retrieved April 10, 2017. ^ "Information: IAP Statistics". Indian Residential Schools Adjudication Secretariat. Archived from the original on November 10, 2016. Retrieved April 10, 2017. ^ "Standing Committee on Aboriginal Affairs and Northern Development – Number 063 – 1st Session – 41st Parliament". Parliament of Canada. March 7, 2013. Archived from the original on September 17, 2016. Retrieved September 5, 2016. ^ "Residential school settlement offers $3K education credits". CBC News. January 24, 2014. Archived from the original on March 25, 2016. Retrieved July 8, 2016. ^ Moran, Ry (24 September 2015). "Truth and Reconciliation Commission". www.thecanadianencyclopedia.ca. Retrieved 2 February 2019. ^ "Truth and Reconciliation Commission of Canada". Indigenous and Northern Affairs Canada. Archived from the original on May 16, 2017. Retrieved April 22, 2017. ^ Mas, Susan (December 15, 2015). "TRC report charts path to 'true reconciliation,' says Trudeau". CBC News. Archived from the original on April 16, 2017. Retrieved April 22, 2017. ^ MacDonald, David B. (October 2, 2015). "Canada's history wars: indigenous genocide and public memory in the United States, Australia and Canada". Journal of Genocide Research. 17 (4): 411–431. doi:10.1080/14623528.2015.1096583. ISSN 1462-3528. (Subscription required (help)). ^ "Canada must confront 'cultural genocide' of residential schools, Truth and Reconciliation report says". CBC News. June 2, 2015. Archived from the original on September 6, 2016. Retrieved August 31, 2016. ^ a b Woolley, Pieta (June 2015). "Grim reminders". The UC Observer. Archived from the original on April 20, 2016. Retrieved June 29, 2016. ^ a b Vincent, Donovan (June 13, 2015). "Aboriginals push to save former Ontario residential school known as 'mush hole'". Toronto Star. Archived from the original on August 15, 2016. Retrieved June 29, 2016. ^ a b "Survivors push to turn former Manitoba residential school into museum". CBC News. December 16, 2015. Archived from the original on August 13, 2016. Retrieved June 29, 2016. ^ Perkel, Colin (April 4, 2016). "Documents of residential school abuse can be destroyed, court rules". Global News. Archived from the original on June 11, 2016. Retrieved July 7, 2016. ^ "Anglican Healing Fund". Anglican Church of Canada. Archived from the original on July 6, 2016. Retrieved July 15, 2016. ^ "Justice and Reconciliation Fund". United Church of Canada. Archived from the original on July 16, 2016. Retrieved July 15, 2016. ^ "Healing & Reconciliation". Presbyterian Church in Canada. Archived from the original on September 16, 2016. Retrieved September 5, 2016. ^ Brown, Louise (July 2, 2016). "Giving a voice to residential school ghosts". Toronto Star. Archived from the original on July 3, 2016. Retrieved July 7, 2016. ^ Macdonald, Nancy (November 19, 2015). "Making history: Indigenous studies now mandatory at two universities". Maclean's. Archived from the original on February 25, 2017. Retrieved April 22, 2017. ^ "Building Reconciliation". Aboriginal Initiatives. University of Saskatchewan. Archived from the original on January 8, 2017. Retrieved April 22, 2017. ^ "Building Reconciliation: Universities answering the TRC's Calls to Action". Federation for the Humanities and Social Sciences. Archived from the original on May 18, 2017. Retrieved April 22, 2017. ^ Griffin, Kevin (March 31, 2017). "Reconciliation Pole at UBC nails the past to confront harsh reality of residential schools". The Vancouver Sun. Archived from the original on May 18, 2017. Retrieved April 22, 2017. ^ "Reconciliation Pole installed on UBC Vancouver campus". UBC News. March 30, 2017. Archived from the original on May 3, 2017. Retrieved April 22, 2017. ^ "Gord Downie's brothers open up about his childhood and legacy". Canadian Broadcasting Corporation. October 21, 2017. ^ Friend, David (December 19, 2017). "Gord Downie named Canadian Press Newsmaker for 2nd consecutive year". CBC News. Retrieved December 19, 2017. "A Lost Heritage: Canada's Residential Schools". CBC Digital Archives. Retrieved August 31, 2016. "The Legacy of the Residential School System in Canada: A Selective Bibliography (August 2009)". Library and Archives Canada. Retrieved August 31, 2016.